On Saturday, July 16th, 2011, Violet Large from Truro, NS died after a long battle with ovarian cancer. 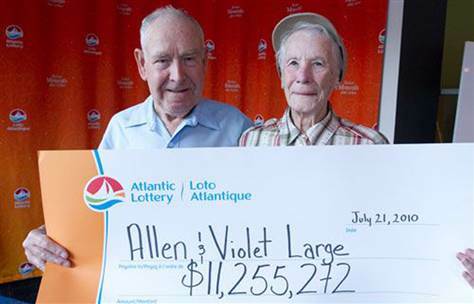 Violet Large, along with her husband Allen, were best remembered for winning a huge $11 million jackpot but decided to give their winnings away to the people that needed it the most. When people read about this act, people would respond with such disbelief, thinking why they would throw such money away or not wanting to take a vacation or get nice things. Yet when I analyzed the story, and now the death of Violet Large, it makes me want to expound on the idea of wealth, riches, and happiness. Turning to the Bible for inspiration, I don’t know the faith background of the Larges, but what I could say is that this is another real life application of how the Bible and its principles are unfolded in every day life. To start, they may have won $11 million dollars, but they didn’t go around loving their newfound wealth or allowing the money to master them. Throughout history and even contemporary society, we see how tragically and very warped people can become when money and the accumulation of it becomes such a part of their lives that their identity is wrapped around it. The status. The power. The prestige. The praise. Here, Alfred and Violet lived a long life to not be bothered by such things. This act of simplicity is what eventually moved me to acknowledge that finally there are people out there that don’t care about puffing him or herself up or being enthralled with the things money can grant. The Large’s also demonstrated the real art of living with great contentment in their circumstances, resources, and in their relationship with one another. The most important things can’t be bought with money, no matter how hard we try. The Large’s could’ve bought a new car, but why bother if it goes down in value within a year. They could travel the world, but after a few months the thrill is gone. What is admirable is that they were content living the simple life, and that their love and devotion as a couple has been so strong over the 35 years that they consider their love to be the greatest treasure. Something that $11 million dollars can never buy. If you want an example of real radical generosity, the Large’s sure have demonstrated it well. Giving to family, friends, charities, and hospitals. Those that sure need the money more than them. Imagine a world where we have wealthy people who don’t think about their little coiffures and instead give liberally to a world that desperately needs grace and healing. Since they have been blessed by such a great blessing, they feel the best way to really live in blessing is to be radical givers. For me, I realize the great blessing that comes from giving. It is a great blessing that through giving of ones self and resources, a smile is generated or a heart is being touched. Instead of having our treasures rotting away and eaten up by moths, the blessing is being put to good use and ensuring eternal legacy and benefits afterward. It has been mentioned in the Bible that a man’s death is better than one’s birth. Now I see why. When word got out of Violet Large’s death, they immediately remembered the woman who graciously gave her resources to the common good of society. Probably doing an act that is not just remembered by those who they helped, but throughout the nation and the world finally fulfilled her purpose after all. If this is a way to leave a legacy, and to fulfill one’s final wish, this was a sure way to do it. Touching hearts, lives, a community, and eventually a nation. After all this, I want to pose the ultimate question and give you two options. What would you do with a million dollars? Would you lavish it on yourself, and swallow in self-praise, prestige, honor and power? Or would you take the latter, and ensure that you are impacting lives, touching hearts, and seeing the fruit of your investment come forth for generations to come?